I have to admit, I've never read a single Ian Rankin book in my life, I'm more of a Pratchett man myself when it comes to reading. So going to see the brand new Rebus play at Nottingham Theatre Royal might have been an odd choice, but I'm always up for a good thriller on stage, and this was a great one! But do you need to know who Rebus is before seeing this play? Does it work for the uninitiated? Why did I pick a Rebus play without reading a jot? My Wife is an avid fan, so I know he's a retired foul mouthed Police Inspector from Edinburgh with a bit of a drinking problem, and never one to play by the rules. But you don't need to know any of that, it's established pretty much within the first two scenes. So even though I've listened to the odd Rebus audio drama, watched a bit of the TV show, done the Edinburgh Rebus tour, they didn't tell me anything I needed to know to thoroughly enjoy this play. The first thing you see as you enter the theatre is the excellent set, the perfect Theatre workspace, providing multiple levels to work on, many entrances and exits, and combined with gauzes, lighting and the odd fly-in/roll-in provides every location needed. Throughout the course of the night this almost static set becomes the streets of Edinburgh, Rebus's home, a nightclub, the evidence room, an old Edinburgh pub, steps of the Police Station and with the clever use of gauzes and lighting tranforms the space into a super villain bachelor penthouse. Even though you don't need to know anything about Rebus, even before the play starts there are details for the loyal readers, such as the bottle of booze on the filing cabinet, the old record player with the old vinyl records and having been to Edinburgh the steps linking the two levels of the stage put me in mind of the closes that riddle the old town, with Fleshmarket Close having been immortalised in one of the Rebus novels. 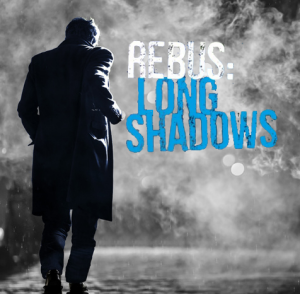 Without giving too much away, the Long Shadows of the title are a couple of cold cases, one that almost literally lands back on Rebus's doorstep, the other being an old case that has finally been solved and is going to trial. One clever element of the staging of this story is the use of ghosts, in particular the two victims of the cold cases. Sometimes appearing ethereally behind gauze at the high level, other times walking round the scene, almost Randall and Hopkirk deceased style, talking to Rebus and taunting him for not solving their cases. This gives an extra level of insight as to what is going onside Rebus's head. Something easy to do in a book, but not so easy on stage. The core of the story though is the sparring between Rebus and his nemesis Cafferty, both Charles Lawson and John Stahl inhabit their respective parts, and even if you haven't seen Rebus before you know EXACTLY who these two men are and what they mean to each other. Great performances from both. Overall a very small cast, with Cathy Tyson playing Siobahn, Dani Heron and Eleanor House putting in fantastic performances as the ghosts and then Neil McKinven playing the entire male population of Edinburgh. If I was to fault this production on anything it would be the size of the cast, with Neil playing 5 parts, albeit with Shakespeare style different coats, you did occasionally feel like Edinburgh had been invaded by clones. But great direction, staging, lighting, sound design, acting and a fantastic story with great twists, this show is a must for any fan of a bit of drama and intrigue, regardless of whether you know Rebus or not. They even manage to throw in a homage to 70s cop show "freeze frame" endings to boot!